Many studies have shown that physical exercise can improve brain health in older adults, however, it is not clear how much exercise is needed. Almost 1,000 clinical trials have studied the effect of physical exercise on cognitive brain health in older adults. The majority of these studies have found that exercise has a positive effect. Despite this, we do not know exactly how much exercise is required to improve cognitive brain health. A group of researchers from around the world set out to investigate this question. They systematically reviewed all the randomized controlled trials that measured the effect of exercise on brain function in older adults. Randomized controlled trials are the gold standard for clinical research. In these studies, participants are randomly assigned to either an exercise group or a non-exercising control group. The researchers tested the participants’ brain function at the beginning and end of the study. These performance tests measure factors such as memory, processing speed, and visuospatial awareness. They then determined if brain function improved more in the exercise group compared to the control group. The results of this review were published in Neurology: Clinical Practice, an official journal of the American Academy of Neurology. The researchers found 98 randomized controlled trials that tested if exercise improved cognitive brain health in older adults. These studies included more than 11,000 participants who were at least 60 years of age. They included a mixture of participants with normal cognitive function, with mild cognitive impairment, or with dementias such as Alzheimer’s disease. Two-thirds of these studies used aerobic exercise or a combination of aerobic exercise and resistance training. There was no relationship between improved brain health and the number of exercise sessions per week, the exercise time per session, exercise intensity, or the overall duration of the study in weeks. However, improved brain health was associated with the total amount of time actually spent exercising; participants in studies that reported an improvement exercised for significantly longer than in studies that saw no improvement. Studies that reported improved brain health included an average of 52 total hours of exercise. In contrast, studies that did not see improvements only included an average of 34 hours of exercise. This does not mean that exercise time per session or the number of sessions per week is irrelevant for brain health. For example, the average study had three exercise sessions per week, averaging one hour each. This is comparable to current recommendations for exercise; The US Department of Health and Human Services and the American Heart Association both recommend 150 minutes of moderate exercise per week. The results of this study suggest that it is important to maintain this schedule for a significant period of time to see improvements in brain health. The researchers pointed out several shortcomings of their analysis. For example, most of the participants in these studies did not exercise before they started their exercise program. It is therefore not known if adults who are already exercising would continue to see improvements in cognitive brain health. It is also possible that the tests of cognitive brain health are overly sensitive. In other words, they might have detected small improvements in brain health that are not large enough to actually make any difference in the lives of the participants. There is a need for new studies that address these questions. 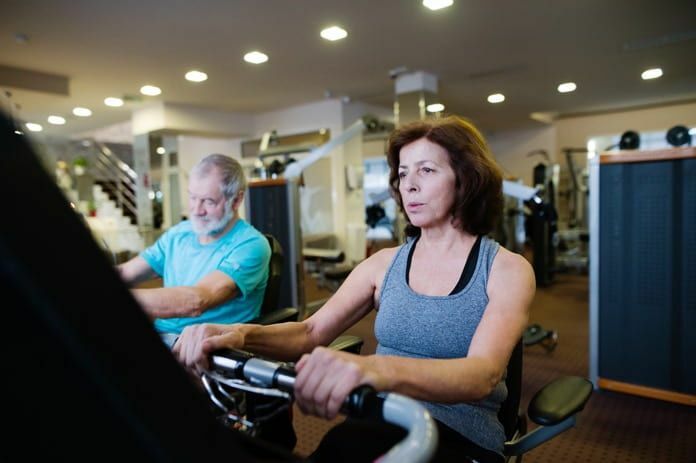 Despite these concerns, the researchers concluded that there is strong evidence that exercise can improve cognitive brain health in older adults. Specifically, exercising for at least 52 hours, broken up into approximately 1-hour sessions, was associated with improved cognitive performance.